Lucy is worried that Aunty Laura will die like Mrs York. 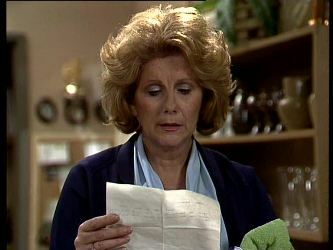 Helen tries to cheer her up by asking her what good things have happened while she's been away. Lucy perks up talking about Des and Daphne and their wedding and they go off to look at bridesmaid dresses. Fred is leaving and buys Charlene off with $50.00. She is thrilled. He gives Madge earrings but she's not so easily pleased - the money was meant to help with debts, not buy fancy gifts. He says he'll have much more money when he gets back and drives off. Madge isn't sure he will be back. Charlene is cross and asks why she can't give him a second chance, he's working hard this time. World War three is avoided when a crying Nikki comes along and tells them about Laura, she's leaving to go to Charleville right now. Charlene cries too and hugs her goodbye, then asks Madge why life is so rotten. She comments that their family isn't close like Nikki's is, which upsets Madge - who answers that her family means the world to her. Charlene argues that that can't be the case, she's just chased her father away. Madge reminds her that Fred left her for another woman but Charlene is too angry to listen. 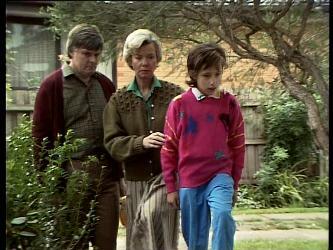 Helen and Lucy ask Tom if he's seen Billy. Turns out this is Mrs York's street, and Billy is lying on her doorstep. As they go closer you can see poor Billy isn't moving. Lucy kneels down and says he's gone to be with Mrs York. 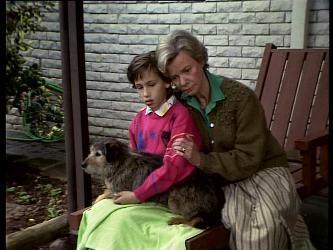 Tom has buried Billy in the back garden while Helen comforts Lucy. Tom says bye to Nikki and says he'll see her again real soon. 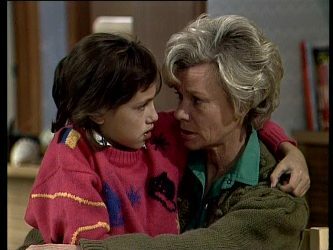 Lucy asks Helen what happens to people when they die and she reassures her that they pass on to a better life. 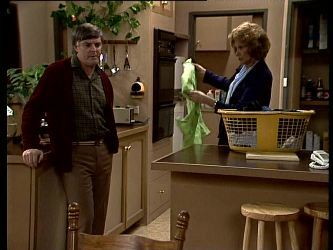 Tom has come to ask Clive's advise about Jean, unaware she's doing the dishes in the kitchen. 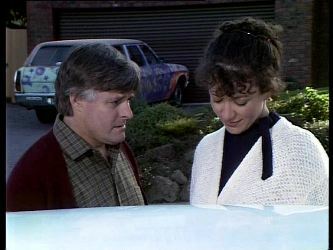 Clive invites him in to have a chat with her and repeats that it's time she told him what was going on. 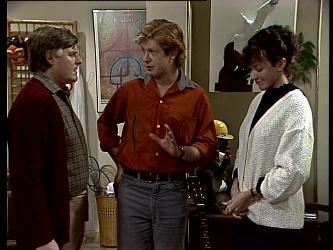 Clive leaves and Jean tells Tom it's impossible for her to keep seeing Tom - because she's married. He is flabbergasted and asks why she didn't tell him that in the first place. She explains that her husband is a quadriplegic who was injured in Vietnam. He can never leave hospital but she'll never stop loving him. She runs out and Tom chases after her. He thinks he should go with her to visit her husband, he was in ‘Nam himself and could talk to him, be friends even. She refuses and drives off. He watches her go sadly. Another sad scene as Nikki says goodbye to Lucy. She makes her promise to write and tell her all about the wedding. Mike shows Cassie into his room and comments that it's “Not much, but it'll do.” She wants to know what it'll do for… Mike is flummoxed. She asks if he's into saving water as she goes off to the shower, then laughs “never mind” as she catches the look on his face. Madge and Charlene are bickering again and Charlene goes on yet again about Madge not giving Fred a fair go. 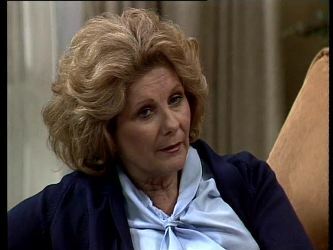 Madge sits her down and says she wants the family back together too, but would have to be very sure Fred had changed before she even considered taking him back. Charlene huffs that she wants some time to herself and thinks she'll go and spend a couple of days with Scott and Mike. Madge, shocked, flatly refuses and Charlene storms out. Mike offers Cassie a juice but she wants something stronger. He apologises that their coach won't allow booze but she moans that she needs something to warm her up. 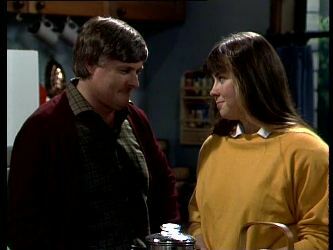 Pleased, he offers her a coffee (come on Mike!) but she doesn't drink coffee because it's bad for you. At a loss now, Mike is all out of drinks ideas. 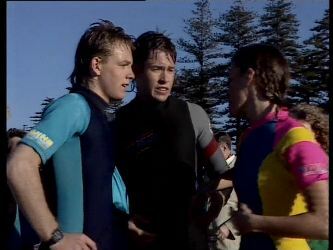 Luckily for him Cassie doesn't give up so easily and tells him she really wants to thank him properly for rescuing her. She kisses him, as Scott returns home to find the door locked. He tactfully bangs on the door until Mike answers, then is almost as naïve as Mike was when Mike tries to explain what's going on. Finally getting the message he agrees to give Mike and Cassie some time together, then sits down to wait right outside the hotel room! Nikki is all packed to go and hugs Clive who promises to say goodbye to Mike for her. Helen rushes her along and they drive off.